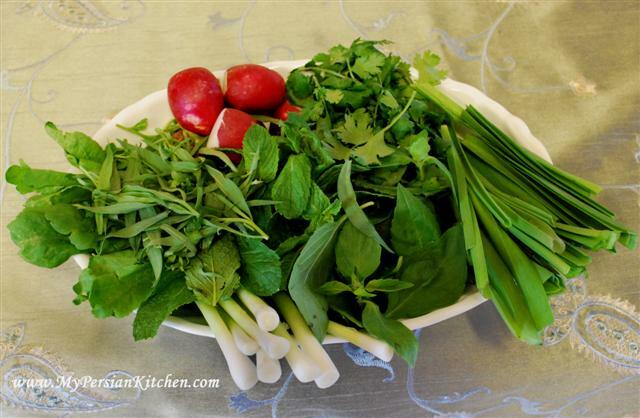 I was introduced to Sabzi as a child when I lived in Iran. Dare I say, it is a given that I love it and don’t find it to be a strange addition to the table. Sabzi so deliciously refreshing especially when you just take a handful and put it in your mouth. I love how the different flavors get mixed in together with the taste of the rest of the meal. I am always amused at the way in which people react to Persian Sabzi. As you may have noticed I, for the most part, have stories that go along food that I love to share. I have two humorous ones for Sabzi. I humorously call these “West meets East” moments! Oh how I laughed! Even though I was only a couple of years older than he was, I knew that he had no idea what he was passing on because, having grown up in Italy, he was not used to the way Persians ate herbs with their meal. I didn’t think anything could top that until…I took The Sous Chef, when we first met, with me to a gathering where Persian food was catered. There was some delicious Kabob, rice, and a huge and inviting platter of Sabzi. We all filled up our plates and went to sit at a table. Both The Sous Chef and I were busy conversing with the people sitting on either side of us while eating. Once the meal was over I asked him how he liked Persian food, as it was his first time having Persian Kabob. “Ohhhh, you mean Sabzi! There is no salad dressing for that. You just eat the herbs with you meal” Do you know how hard I had to try to contain myself from laughing out loud? VERY HARD! Oh how he cracked me up! Moving right along, here is a tutorial on how to clean and present Persian Herbs. Look at these beauties! I always buy my herbs from my local Persian Store. 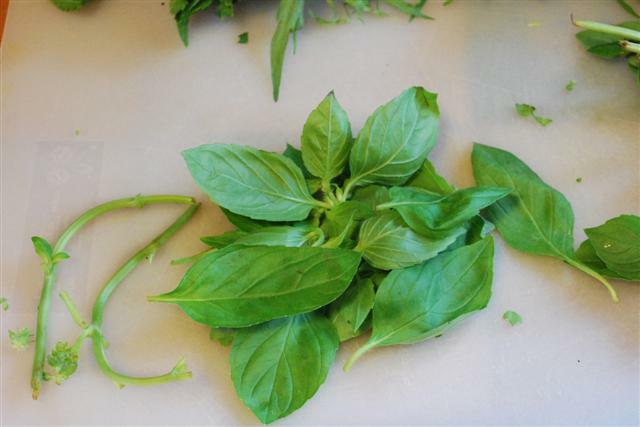 Remove the top portion of each Basil then removed each leaf from the bottom part and place aside. Please note that Persian Basil tastes and smells different than Italian Basil which is the kind that most people are used to. 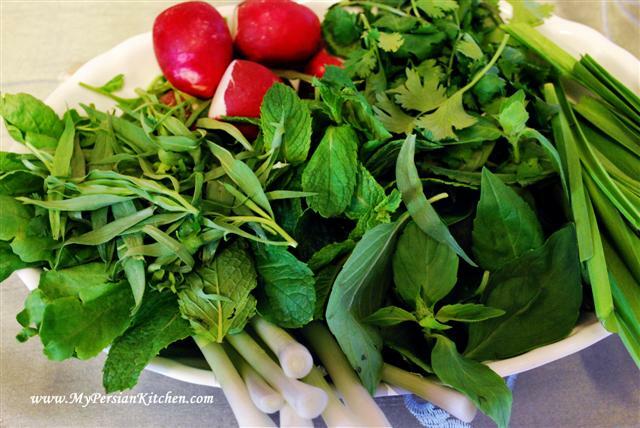 I would say that Persian Basil is a cross between Thai Basil and Lemon Basil. 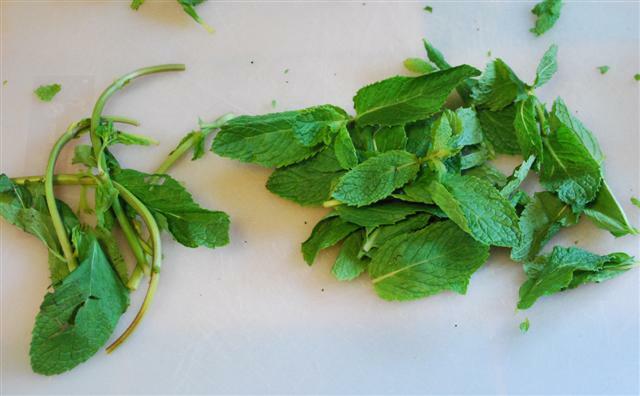 Do the same thing with the mint, removing the top part leaving it intact and then removing the individual leaves. 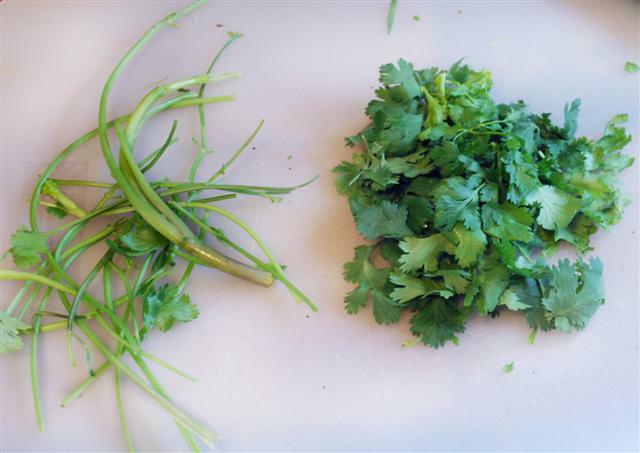 With cilantro you can either remove all leaves, like I do, or just cut off the bottom part of the stem that is thicker and tougher. 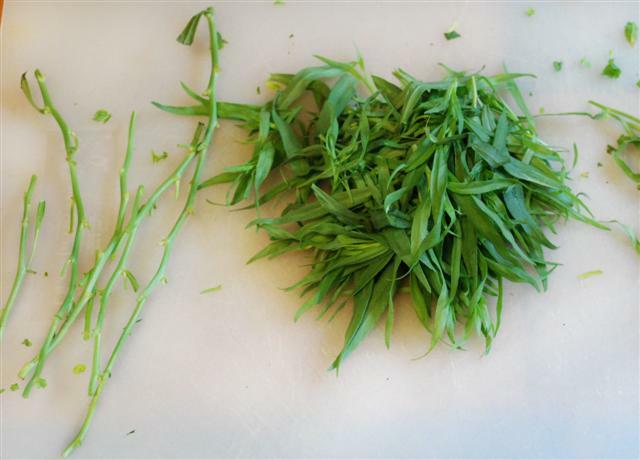 Remove all the leaves from the Tarragon’s stem. 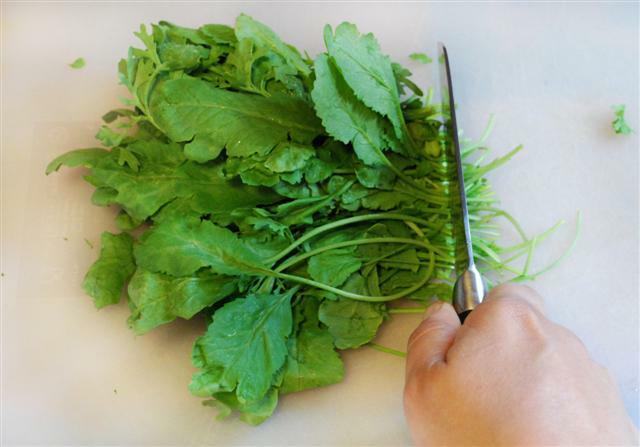 Cut the bottom part of the watercress’ stem. 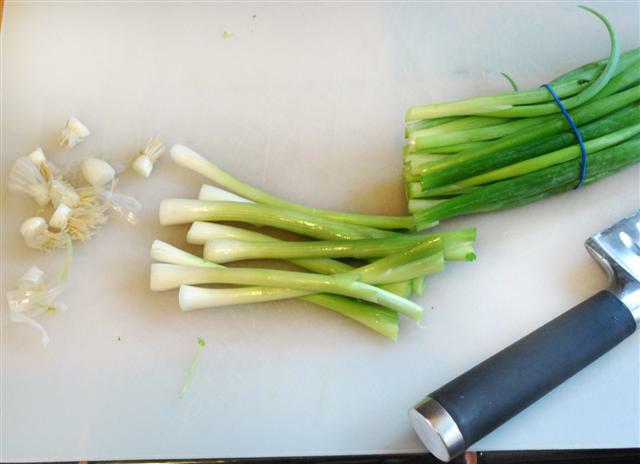 Remove the top end of each green onion and also cut just around the portion where it starts splitting off. Cut off the dried up ends of Chives. This means a small portion off each end. Cut off the top portion of the radishes. You can either cut the leafy part or them on. Some Persians like to eat the leaves. 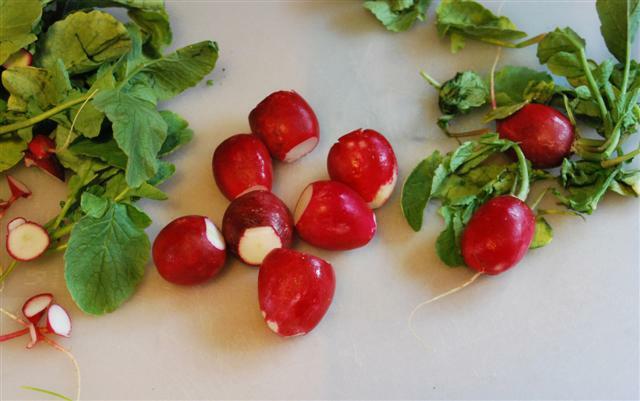 You can also get creative with your radishes, you can make small incisions around them and place them in a bowl of water for about one hour. The parts with the incisions will open up making the radish look like a flower. Arrange your herbs in a dish. A couple of things, you may choose to mix your herbs together or place them like I did. It i completely up to you. Also, you can either wash your herbs before or after cutting them. I personally like to wash them after I clean them up. Important note, if you have leftovers place them all in a lightly damp kitchen towel or paper towel. Put your little bundle in a zip lock bag and keep in the fridge. Note that they will last longer this way, but no more than a few days. They look so fresh and crisp and tasty. Love the colorful photos. Fantastic Persian blog! I’m very glad I found you. Lori Lynn, they are soo soo good! A bit of work to clean up, but well worth the effort! Maninas, glad you found me! Please keep on coming back! Love sabzi. Yours herbs look so beautiful! i was looking for the receipe for ghormeh sabzi…and i couldn’t find it on ur site …. please could u tell me which herbs you use in the dish (apart from dried fenugreek which i know about already) and do u have to use boneless lamb? or any other meat would do? I have not posted Ghormeh Sabzi yet, but it is on my list. The herbs used are usually parsley, chives, and cilantro to the best of my knowledge. This khoresht is traditionally made with cubed meat. I have seen people make it with chicken as well, but I think it tastes much better with stewing meat or cubed lamb. Ramez, unfortunately, I only have a fourth grade education in Farsi and writing my content in Farsi would take me forever. Sorry! I love your blog. I’m planning to make the kuku soon with home grown yellow summer squash. I’m wondering about a couple of your herbs. This is nitpicky details but I’m curious. Do you use a specific type of mint? Your chives look broad and flat, is that correct? I’m trying to figure out what they are. I’ve read of 3 types of chives. The chives I know best have round leaves and pink/purple flowers in late spring. While garlic chives (and maybe another allium that I’m not familiar with but have read about called leek chives) have broad flat leaves. My garlic chives have white flowers later in summer. 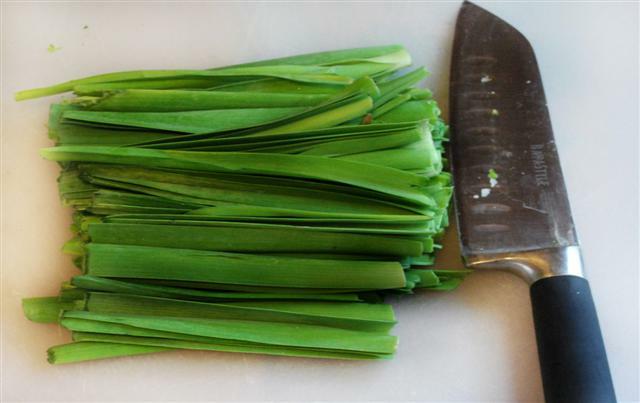 Or are your chives simply the tops of the green onions? I’m so interested in the details and appreciate any you can offer. momomom, good questions! The type of mint that I use is the ones that are found at the store and are simply named mint. The chives are a favorite in Persian cooking and they are indeed wider than the regular ones. A good substitute can also be the tops of green onions. Christina, I have no idea as I have never purchased them before. You may want to look for either lemon basil seeds or holy basil online or at your local nursery. I did indeed make the kuku and it was very good the first time when I made it with fresh squash. A later experiment with frozen (from my garden) zucchinni was … not so good. Lesson learned. From what you are saying I think your chives are what I call garlic chives. Do they have a bit of a garlic like smell when crushed? momomom. yes, they do have a hint of garlic, however, they are much wider than regular chives! Oooooooooh, I know what that is! I too like to serve it with my dishes (as I grew up across the border from you and at about the same time I think), and for Americans this is unusual. hello , I was wondering why I cant leave a comment or ask any questions on your site from tehran. I am in Britain at the moment , so I think it will work from here! I am baffled and have a question about Chives, Tare is this the same thing because I have seen ”Tare faranghi” and I think this is the typical Leek what we eat in the U.k.? Spring onions are your ”pioz che” am I right? and is Water cress the same as Shahin? Because they look different in appearance? Catherine, I don’t know why you are not able to leave a comment from Tehran, I have other readers who leave comments from Iran without any problems. 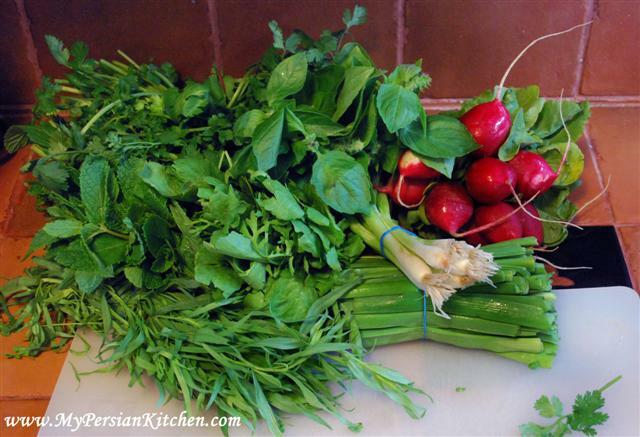 Persian chive is tarreh, Tarreh faranghi is leek, green onions are piazcheh, and yes, watercress is shahi. Is shahi same as upland watercress which has peppery taste. Vilas, Shahi is cress and it is related to the watercress family. I hope this helps! I am looking for shahi and Rehan (Iranian Basil) seeds, please do advise where can I find and order. Chris, you can probably buy both of them online. Many years ago I came across a herb that was used in rice to provide a wonderful aroma. As far as my Farsi permits it sounded like “bar drang or barrang”. I cannot remember the exact name. I have not been able to find out more about it. Any idea what this herb is called in English? Love your site and colourful pictures that spring out of screen. The phrase “leek chives” is one that people often use when referring to Persian cuisine, but I am not sure that such a vegetable exists in the English language. It may be that it is just a name adopted here to describe tareh because we do not have any other way of describing it? I have not yet found where to get tareh seeds in the UK. For this reason chives, garlic chives, or spring onions, etc., are often used as a substitute. I’m looking for the English name of a sabzi that is found in the north of Iran called Kootkootoo. Please don’t laugh at the spelling LOLL I don’t have a clue how to write it. It’s very fragrant and spreads like mint. Any ideas. Maria, I don’t think I know what that is! This blog is awesome! It really help me a lot. I love cooking and trying to be good in persian cuisine as i am trying soooo hard in speaking farsi. @ maria, you wouldn’t believe that i love that sabzi as well, I’m from Philippines and married to a persian, currently I’m here in Tehran. My father-in-law is from shomal. When his sister came to visit us, she brought some of that veggie, since then i was looking for the English name of that. hehe, i believe its a relative of mint. i know it doesn’t help about your question but can’t help to comment, just wanted to share..
I’m delighted with your blog. I found it very useful and accurate. Your blog is decorated with clear great colourful photos. Thank you very much.